Below is a video tutorial on how to make these chops and the written recipe! ENJOY! Preheat oven to 350 degrees F then mix in salt and pepper with bread crumbs. 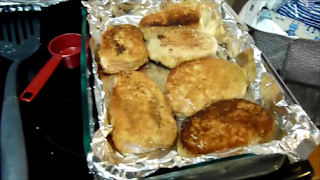 Beat egg and milk, then dip chops in egg mixture first, then coat with bread crumbs on all sides. Brown chops in a skillet using 3 tbsp or more of olive oil. Next put chops in a greased baking dish in a single layer.